Yankee sponsors three weekends of indoor agility trials in southern New England. 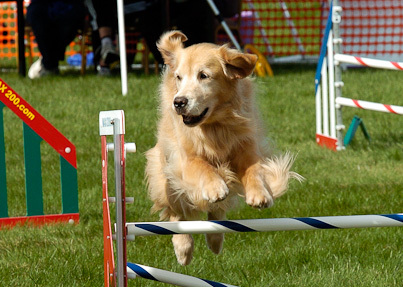 Dog agility started in England in 1978 as an event to fill in the intermissions at Crufts. It has rapidly spread around the world and continues to grow in popularity. There are several titling organizations in the U. S. including the AKC (American Kennel Club), UKC (United Kennel Club), NADAC (North American Dog Agility Council), USDAA (United States Dog Agility Association), and CPE (Canine Performance Events). 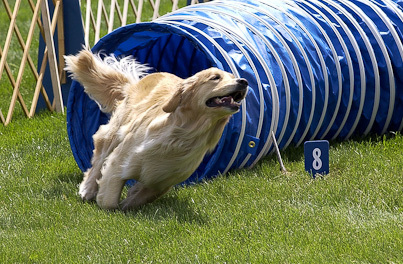 Across these organizations obstacles and rules vary somewhat depending on the event or game; obstacles can include open and closed tunnels, weave poles, dog walk, tire jump, A-frame, pause table, teeter, and many different jumps. Scores are based on time plus faults, with titling runs often, but not always, requiring clean runs (no faults, under time). 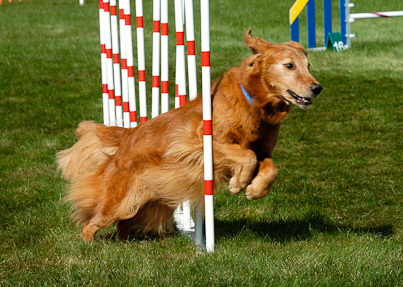 There are many varied and exciting games in agility in addition to the standard titling runs for agility titles. 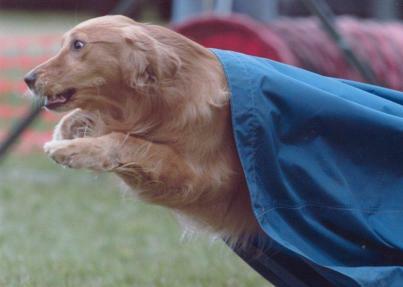 Many Goldens (and their handlers) love and excel at the sport. 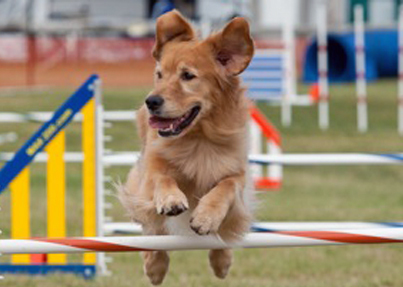 Agility is a great confidence builder and enhances any dog/handler relationship, which helps in all competitive dog activities. 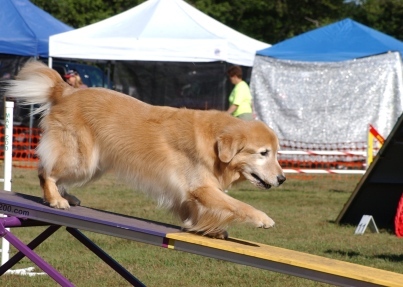 YGRC began holding AKC agility trials in 1997 during the Labor Day weekend at Merryfield Farms in Massachusetts. 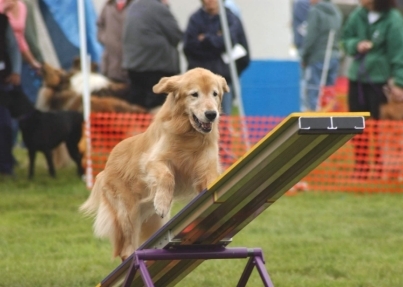 In 1998, Yankee teamed with Shrewsbury Dog Training Club to hold 4 days of agility trials as part of the Bay Colony Cluster in Boston, and began hosting the entire weekend of trials in 1999. 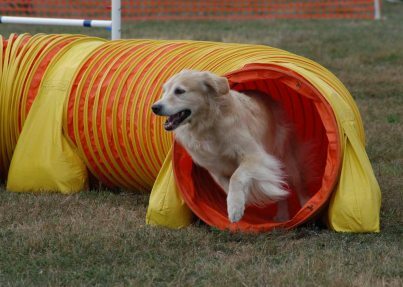 The Boston trials continued for a total of 11 years, becoming known as the Grand Finale of the agility season in New England. When the Bay Colony Cluster agreement with the Boston site ended after the 2008 shows, Yankee moved its December trials to Manchester NH. 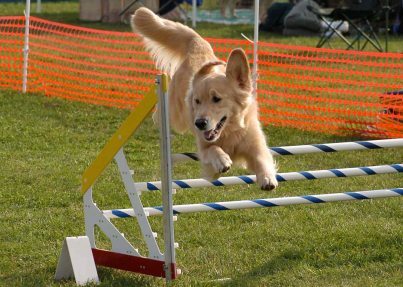 Beginning in 2000, Yankee held agility trials in conjunction with its spring specialty show and obedience trial in May, having dropped the Labor Day trials. These trials were later split off from the specialty and are now held indoors in July. 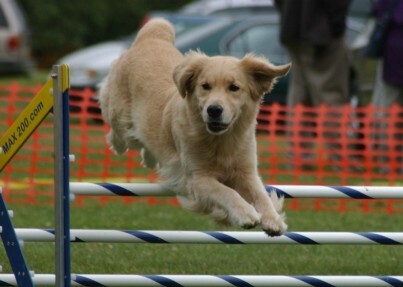 An additional weekend of agility trials was added in August 2010. In 2014 the August trials were moved to March.